Alpes Lima i Lima, Peru : Boka nu! A really good hostel! Good location , close to Kennedy park and to the beach. Nice rooms with good beds and they had a really nice bar upstairs where there always where people hanging out! A really nice vibe at the hostel, and the staff is super nice and helpful! I stayed eight days and I loved it! Friendly and helpful staff. Great location. Social atmosphere. Dorms quite comfortable. The kitchen is a little small, but at least when I was there no one else was using it. Riktigt härligt hostel med ok/bra wifi, fräscha badrum och riktigt härlig stämning! Perfekt för er som gärna avslutar dagen med en öl eller två på en solig takterrass med andra trevliga människor! Bor med 100% säkerhet här igen nästa gång det bär av till Lima! Good location only a 10min walk to the Kennedy park and about the same to the beach. Good atmosphere and the bartender made everyone feel welcome. Stayed in a girls dorm and it had comfy beds, individual lamp and outlet and a lockers in the room. Clean enough and typical hostel breakfast with coffee/tea, bread and jam. Kitchen Is small but works. Good WiFi. Do not do your laundry here, it was not clean when I got it back 24h later. I would definitely stay here again. 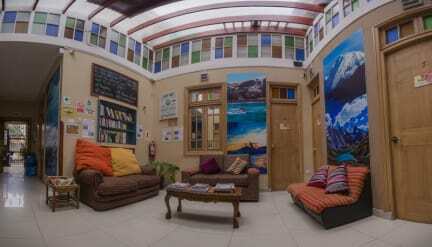 A lovely sociable hostel in Lima. Shout out to the hilarious bartender who made my stay there even better. What I loved about this place was that everyone hangs out together. Almost everyone does the walking tour so I would definitely recommend that! The bar area in the evenings was full of people when I stayed there and we had a blast. The rest of the staff were a bit cliquey but just ignore them. Amazing staff that spoke great english. The rooms were nice with plenty of space, a private locker/ lamp and two bathrooms with one shower. Basic breakfast. Nice rooftop. Have two computers that are free of charge. Nice atmosphere, nice terrace with a bar and where you could eat you cooked dinner. We did our laundry here, and when we got it back it still felt dirty. Would recommend to do your laundry elsewhere. They also payed us more for the hostel then they supposed to, and we realized that to late, so we have our selves to blame. But we heard the same thing from another girl, so just be aware of that. Otherwise, nice hostel, nice staff, good location and nice atmosphere. Would stay again.